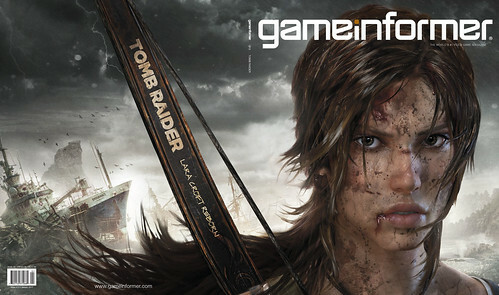 Game Informer has revealed in its January cover story – the oft-rumored Tomb Raider reboot. The new game, called simply Tomb Raider, features a younger Lara Croft shipwrecked on a mysterious island and forced to survive on her own. According to developer Crystal Dynamics, the decision to tell a Lara Croft origin story was “an act of necessity.” The developer felt they needed to literally break down the character in order to once again make her relevant to the game industry. This is the second Crystal Dynamics-helmed reboot of the franchise, the first being the critically acclaimed Tomb Raider Legend released in 2006. The studio’s most recent “full” entry in the series, 2008’s Tomb Raider: Underworld, was met with favorable reviews but failed to meet sales expectations. Lara was most recently seen this past summer in the well-reviewed downloadable title Lara Croft and the Guardian of Light. Even without the Tomb Raider name, a survival-themed game sounds like a long overdue concept to me. The fact that it gives a gaming icon a second shot at life is just icing on the cake. Expect more information on the game when the January issue of Game Informer releases on December 11.